Five cameras, 20 sets, 70 puppets and 16 people walk into the Ferst Center for the Arts for two nights, and each night they film a movie in one take and in real time. Somehow, it works and it is brilliant. “Nufonia Must Fall” is based on a graphic novel by Eric San, a DJ and musician who goes by the stage name Kid Koala. In the novel, a robot is rapidly becoming obsolete but falls for a human woman named Malorie. Though nearly wordless on both the page and the stage, their humorous and emotional love story ensues. The show’s tours across the globe over the past several years led it to a limited engagement at the Ferst Center for the Arts on the nights of Feb. 12 and 13. When entering the theater, the audience was greeted by the visual cacophony of the stage itself; there were clearly music stands center stage, and a DJ setup alongside them. But the stage was lined with diorama-like sets standing mostly at about chest-height, and surrounding the sets were all manner of tripods and rigs holding cameras and lights. The Ferst Center’s projection screen was lowered into the background of the stage at showtime. If this setup sounds confusing, that is a fair assessment. Especially in the first few minutes of the show, it was difficult to decide which aspect of the action to look at. The live string quartet was responsible for the modern, graceful score, accompanied by Kid Koala handling the electronic end and some occasional percussion. The actions they score played out on the projector behind them but also around them as puppeteers bustled across the stage positioning figures and cameras. Somehow, it all grew to feel like one cohesive unit, much like a chamber orchestra playing off each others’ cues. The audience, much like the performers onstage, eventually found a flow where all of the disconnected moving parts clicked together. If one were assessing “Nufonia Must Fall” as a self-contained film, as it appeared on the projector and in one’s ears, it was endearing and heart-wrenching. The puppet characters were asymmetrical and bursting with personality, even with little to no discernible dialogue. The world they inhabited was bare and black-and-white in a utilitarian, almost corporatized way. The lighting effects deserved a special note: flickering headlights and flashes of lightning enhanced the mood. Told in three acts, the story played out like a funnier “Wall-E” with plot twists that — to its credit — are bona-fide twists and not softballs. Without spoiling the story, there were aww-inducing moments juxtaposed with ones that made the audience gasp out loud. At times seeming like a series of vignettes instead of a cohesive story, the plot was simple, but it moved along. The ending might be happy or might be bittersweet, depending on who one asks, but it was indisputably lovely to watch. As a film, “Nufonia Must Fall” can capably stand on its own, but in the context of the live performance, its technical achievements were truly exceptional. The synchronization between the puppeteers’ movements and the creative musical effects — a grating violin as a frustrated robot, for example — was absolutely seamless. to be multi-talented as they bounced between pizzicato, drums and a particularly lovely kazoo break. Cuts to black were utilized for dramatic emphasis and strategically to give puppeteers time to reposition themselves and the cameras. Cuts between cameras that gave different angles of the same scene were smooth and made sense visually, even when those shots are happening on opposite ends of the stage. After the show, the audience was treated with the opportunity to walk onstage and examine the sets and puppets up close. What was endearingly rudimentary onscreen, like wonky handwritten signs, turned out to be remarkably detailed up close. The plastic puppets, some hardly an inch tall and some approaching a foot, were also quite intricate. The nature of “Nufonia Must Fall” as a travelling puppet show done entirely live allows for a degree of customizability as it runs across the country. 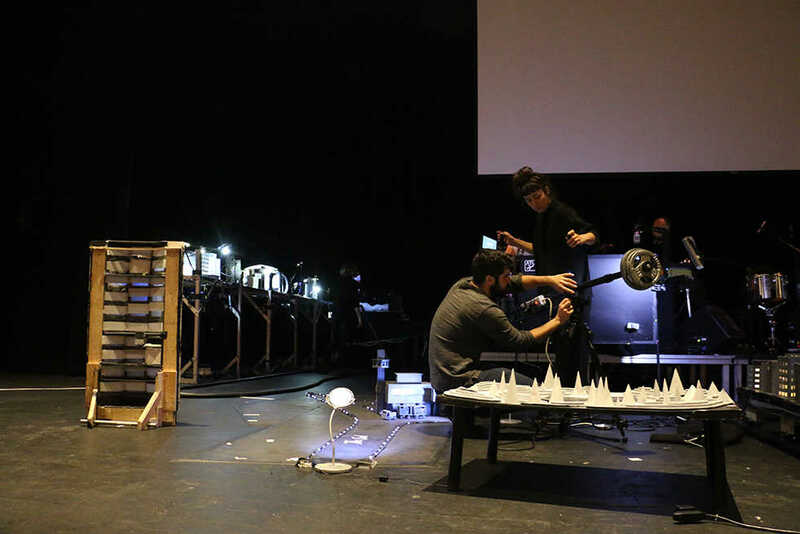 Without any knowledge of the production as it appears on other stages across the world, the Ferst Center performances featured a lively cameo by the Tech Trolley and Atlantan Easter eggs nestled into the city through which Malorie and the robot wander. As Kid Koala explained during the show’s opening, Nufonia is derived from the idea of “no fun.” It is a place, perhaps the tiny city shown onscreen and onstage, but it is also a state of mind. This innovative and achingly sweet theatrical experience made Nufonia fall away, at least for the moments while one’s eyes were glued to its calculated chaos.